This is a great course i want to thank Sebastian for all the help he has give me with the problems i have come access. I would recommend this course to any one. I am really enjoyed this series of videos called E-Commerce. I learned lot from this course. Without any doubt this is the best Php E-Commerce Course series. I would recommend this course. The instructor is very clear and the info is very good. Thanks for further enriching the main selection with another add-on. This add- on helps advancing to another level from ground-up. Thoughtful structure and well-explained introductions to new material, ease the anxiety and enjoy developing the new skill . Short clear demonstrations maximize the effectiveness of newly acquired tool to know how. Hope more useful add-ons like this available in future publication. So many courses teach you some superficial knowledge of web programming, syntax how to write a few lines of code and then what? Sebastian's courses take you to another level. His courses are well thought out and planned. He takes you through all the stages of the development of a serious e-commerce application and you will not find courses of this quality anywhere else. Once again, I made the right choice purchasing Mr. Sulinski’s class. It is pack with tons of information and very easy to follow step by step instruction. I’m learning so much from him and I will continued to take his class and recommend his class to anyone I know. 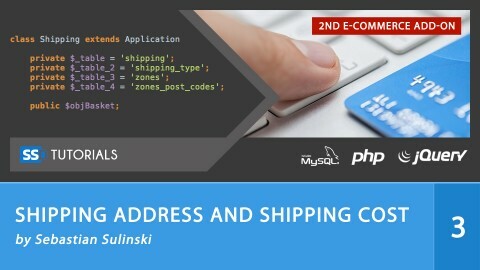 with this course you will learn to add a MUST features like shipping address and shipping cost, my e-commerce will become awesome! Thanks! So glad I have purchased this one along with his previous courses in this series. Sebastian is a caring, knowledgable instructor with excellent quality content. Easy to follow along. Exactly what I was looking for. Thanks so much! This is really an awesome course. Simple and easy to follow. When I say this lecture is amazing I truly mean it. This lecture is well paced, it's easy to go along with, and you learn everything you need to know to build an e-commerce system. Well done a brilliant addon.